Stoner Trim Shine for Vinyl, Plastic and Rubber Protectant is an easy-to-use, spray-on coating that instantly shines and brightens dull or faded plastic, vinyl, rubber, and other surfaces. Trim Shine restores color and brilliance to bumpers, running boards, door trim, convertible tops, dashboards, seating, AC vents, hoses, door gaskets, and more. It even hides ugly white wax marks on black exterior trim. 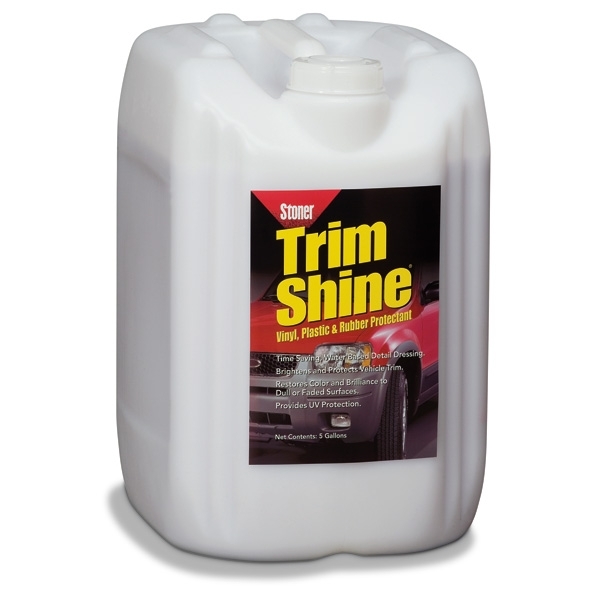 Trim Shine utilizes a proprietary Wipe-FREE aerosol technology. Just spray it on and walk away. Needs no wiping or rags. NO dirty hands or waste like with drippy, milky products (many pros avoid them too time consuming and streaky). Perfect for hard-to-reach areas like dashboards and under the hood. Take to the car wash even shines wet trim Finicky detailers use Trim Shine and charge $100 or even $150. Now YOU can make your vehicle look brand-new, protect your investment, and boost your resale or trade-in value in seconds with Trim Shine. Best of all, Trim Shine protects against damaging sunlight and UV rays.